Nathan Paikai is one of the directors of the Donald Trump campaign in Hawaii. Paikai offered some heartfelt remarks for the local news, after learning of Trump’s win. I believe that Paikai’s sentiments, captured below, represent the overwhelming number of Americans who line up, sometimes under the most extreme inclement weather, to show their support for Donald Trump– the “imperfect” man who has had the courage to confront the corruption inside the GOP, and in doing so has managed to perfectly capture the imagination and the passion of the American public– on all sides. Nathan Pakai, News, Nouvelles, Noticias, Notizie, Actualidades, Donald Trump, GOP Debate, Current Events, 2016 presidential election. The hypocrisy of the mainstream media continues to offend the intelligence of the American voter. For years the so-called “journalists” and political pundits of the mainstream media have been throwing in our face homosexual “marriage” and abortion “rights” as being normal. But now that Donald Trump has defended his ‘manhood’ the mainstream media is reacting with indignation. This is the height of hypocrisy! Manhood, Abortion, Avortement, Aborto, Mainstream Media, Hypocrisy, GOP, GOP Debate, Donald Trump, 2016 Presidential Elections, Marielena Montesino de Stuart, Marielena Speaks, Nouvelles, Noticias, News, Current Events. Another long debate with so much acting-out and little or no substance. Another show for network ratings and profits– and not a word about the defense of innocent human life. A nation that elects a leader who does not place the defense of innocent and defenseless human life above all– is a nation which has sold its future to materialistic atheism. He had grown accustomed to the perks that come with being a powerful property tycoon who plays according to the Communist Party rules– that is until his fingers got too happy on the keyboard. Ren Zhiqiang had over 30 million followers on his microblogging account. But everything came to a screeching halt when he criticized Xi Jinping, the President of Communist China. Mr. Ren asked for state media to serve the people of China- who, after all, are the ones who pay for it. Beijing’s government immediately took action to censor and shut down his account and issued statements accusing Mr. Ren of subversive activities against the government. As a Communist dictatorship, China maintains very strict Internet regulations– which include blocking major websites and censorship of posts by audacious bloggers. China’s censorship program is massive– given the fact that China represents the largest online population in the world. China’s political situation worries her greatly. “The level of oppression, Orwellian security is very serious,” she says. “I feel perhaps I need to ratchet up the coverage over some of the sombre truths. Last summer, some Hong Kong booksellers disappeared– and journalists are under constant threat. Lawyers are being imprisoned (but I must admit that the idea of trying to practice “law” under a Communist dictatorship is baffling!). Xi Jinping is turning out to be Mao in a suit and tie. His reign of terror is driving underground just about anyone who opposes him. Or they leave China, before it’s too late. BAGHDAD — Militants attacked an outdoor market on Sunday in eastern Baghdad, killing at least 59 people and wounding nearly 100, officials said. A bomb ripped through the crowded Mredi market in the Shiite district of Sadr City, a police officer said. Minutes later, a suicide bomber blew himself up amid the crowd that had gathered at the site of the first bombing, he added. Interior Ministry spokesman Sad Main said the bombings killed 38 people and wounded another 62. Multiple hospital officials later increased the casualty toll to 59 dead and 95 wounded. All officials spoke on condition of anonymity as they were not authorized to release information. The attack was the deadliest in a wave of recent explosions that have targeted commercial areas in and outside Baghdad. Obama’s approach of leading from behind has failed. The military experts that he sent to the area a few months ago do not appear to have the situation under control– and the ISIS bloody footprint in Baghdad, as the capital of Iraq, will be very difficult to remove. The new POTUS in 2017 will have to do a major overhaul of our Middle East policy. @Marielena Montesino de Stuart. All rights reserved. As someone who suffered under the bloody Communist dictatorship of Fidel Castro, I am deeply concerned about the lack of interest in discussing the plight of the Cuban people during the Republican presidential debates. There has also been little or no discussion of Obama’s one-way diplomacy with Cuba. This silence about Cuba, on the part of the candidates, extends to their time on the campaign trail. Two of the candidates for POTUS, Marco Rubio and Ted Cruz, are sons of Cuban immigrants. What’s going on? GOP Debate, China, Music, Obama, Iraq, Super Tuesday, Cuba, Pakistan, Abortion, Avortement, Aborto, News, Noticias, Notizie, Nouvelles, Current Events, Actualidades, Donald Trump, Marco Rubio, Ted Cruz, Marielena Montesino de Stuart. I am very touched by the overwhelming support of this popular article. Please continue to SHARE it… because the truth is contagious! Adapted from a painting titled Portrait of Mr. Van Amburgh as he appeared with his animals at the London Theatres, by Sir Edwin Henry Landseer (1846-1847). I don’t think I can take another GOP presidential debate. Yesterday, Donald Trump looked like a ringmaster being attacked, not by two lions– but by two pit bulls, in the form of Marco Rubio and Ted Cruz– while critical issues fell by the wayside. Things got so out of hand last night– that Dr. Ben Carson, the brain surgeon, asked to be attacked so he could have a chance at saying something, as a presidential candidate in the arena. The entire debate was centered on Marco Rubio and Ted Cruz attacking Trump. This made Rubio and Cruz look awkward– since they are more comfortable in their normal environment of reciting lines. Reciting lines is all Rubio and Cruz have time for at the end of the day, after compromising their future as public officials, by running after pro-LGBT donors and others with their own political agendas. After seeking donations from pro-LGBT donors and voting in favor of confirming Todd M. Hughes (Obama’s “Gay”-activist judge)– Ted Cruz and Marco Rubio still have the nerve to tell us that they want to defend traditional marriage. Thank God that at least Donald Trump, with all his imperfections, is not running after the powerful LGBT collective and other special interest groups. Donald Trump is funding his campaign with his own money. Having said this, I strongly disagree with Donald Trump’s remarks about Planned Parenthood offering valuable health services to women– even though he has made it clear he will defund Planned Parenthood if they continue to conduct abortions. Planned Parenthood is so immersed in the field of abortion– that it is impossible to trust them. There are plenty of medical facilities across the United States where women can seek health services, without the need of walking into a Planned Parenthood center. Trump really needs help on this subject. Donald Trump is also misinformed on the issue of Cuba— although it was not discussed in last night’s debate. Trump believes that Obama could have made a “better deal” or a “stronger deal” with Cuba. The Communists in Cuba do not deserve deals. They need an offer they can’t refuse, which should result in freedom for the Cuban people– after more than half a century of death and destruction under a Communist dictatorship. Pressure works, NOT dialogue. TheDC: What do you think of the opening with Cuba? Do you think that is a good policy, or do you oppose America’s opening with Cuba? Trump: I think it’s fine. I think it’s fine, but we should have made a better deal. The concept of opening with Cuba — 50 years is enough — the concept of opening with Cuba is fine. I think we should have made a stronger deal. But what hope is there in Ted Cruz and Marco Rubio, when it comes to Cuba? Both of them consider that Nelson Mandela was a great man! Nelson Mandela was one of the most ruthless Communist terrorists of the 20th and 21st Century– and a close friend of Fidel Castro. 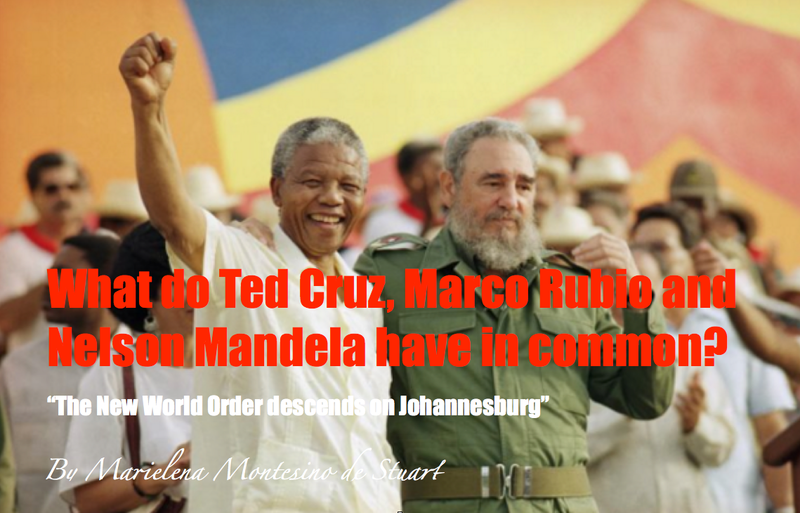 NELSON MANDELA and FIDEL CASTRO: Ted Cruz and Marco Rubio consider that Nelson Mandela was a great man. Those of us who defend the unborn without exceptions– and advocate that marriage must be restricted to one man and one woman, know full well that there’s no one out there right now– who wants to win— who will come out in the middle of an election and confront these issues head on, considering the corrupt environment of the GOP. I did– during my campaign for the U.S. Senate in 2012 (on the ballot, Florida)— and I lost, but my position on these matters will always remain intact. My open and uncompromising defense of the unborn, without exceptions, as well as my denouncement of the homosexual collective was too much for the GOP establishment. Furthermore, my opinion on trade, Communist China and Sustainable Development did not endear me to the GOP pit bulls who line their pockets in these areas. Even my argument for a tougher stance on those doing business with Cuba was met with restrained approval by many Republicans. Donald Trump knows full well that this so-called “debate” is nothing but entertainment for ratings– and Trump treats it as such– while Marco Rubio and Ted Cruz attack him. But even with my penchant for humor, having been a very hard working candidate myself, I would be very frustrated on that stage not being able to elaborate on critical issues that affect public policy, trade and foreign affairs. As such, these “debates” turn into a circus– and a string of missed opportunities. Meanwhile, Trump’s approach seems to be working. In fact, so much so, that he even ordered Wolf Blitzer to “move on“– when Ted Cruz complained that Trump called him a liar. Blitzer immediately did as Trump ordered. He moved on. It’s obvious that Donald J. Trump is the ringmaster, in what has become the greatest show on earth: the 2016 race for the White House. 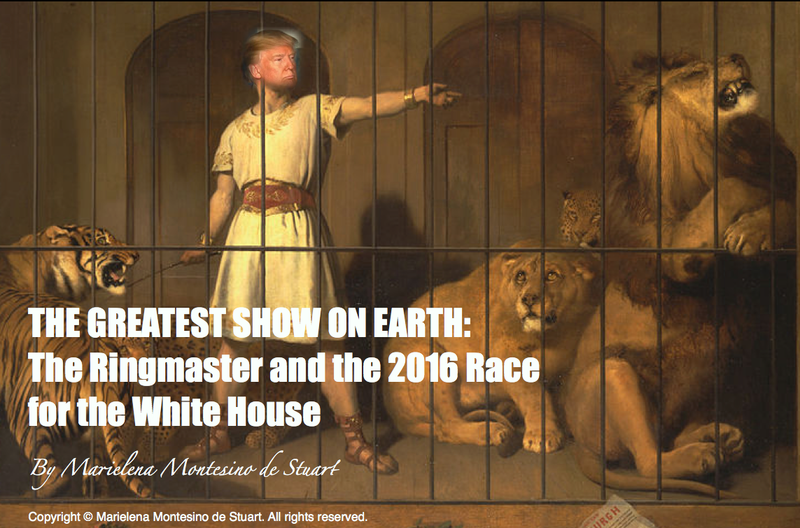 The Greatest Show on Earth: The Ringmaster and the 2016 Race for the White House, Whipping them into Submission, Planned Parenthood, News, Nouvelles, Notizie, Noticias, Avortement, Current Events, Actualidades, Aborto, Abortion, Marriage between one man and one woman. Celebrating love between one man and one woman. This is God’s gift to us for the continuation of humanity. It doesn’t get better than that… Happy Valentine’s Day. “With so many political expediency dogmas in place, we can see that religion and God are placed on the back burner–and brought to the front only when politicians need all the help they can get in order to control societal unrest or improve their image. More and more we see how God is used as a convenient tool– and not as the basis for sound public policy. The United States of America has been deeply wounded for many decades, morally and financially, with the decisions that have come out of the U.S. Supreme Court. Roe vs. Wade, Obamacare and homosexual “marriage” have thrown the United States into the abyss of materialistic atheism (socialism). I have spent most of my adult life warning others about this catastrophe, which continues to advance through the socialist indoctrination of young people. It is no wonder that a very large percentage of millennials support Bernie Sanders. During my campaign for the U.S. Senate in 2012 (on the ballot) I was scolded by certain so-called “conservatives” in the Republican Party for denouncing those in our midst who claim that they support marriage between one man and one woman– but are found fraternizing and socializing in homosexual circles– while they seek money and support from the homosexual collective for their political endeavors. Here’s a current example. This duality hypocrisy is pervasive and persistent in Republican circles. I have also been criticized for exposing those who claim to be pro-life– but consider that they still reserve the right to choose who gets to live and who gets to die. That, dear reader, is not an authentic pro-life position (particularly if you are a Catholic! )– as in this case and this case. √ Millions of children have been killed through abortion– so many, in fact, that the number now exceeds the population of Great Britain. √ Homage is paid to individuals in powerful positions (judges, legislators, educators) based, in great part, on their openness about their sexual recreation as homosexuals– which is extolled as a virtue. If this immoral scenario does not upset you deeply– then you too have become a fellow traveler who is willing to participate and remain in this socialist abyss. Now that I have totally disrupted your Valentine’s Day with the truth… allow me to share with you a short video clip below, from the last scene of the classic film A Man and a Woman. Hurry up and watch it… before the enemies of God’s true love take it down. 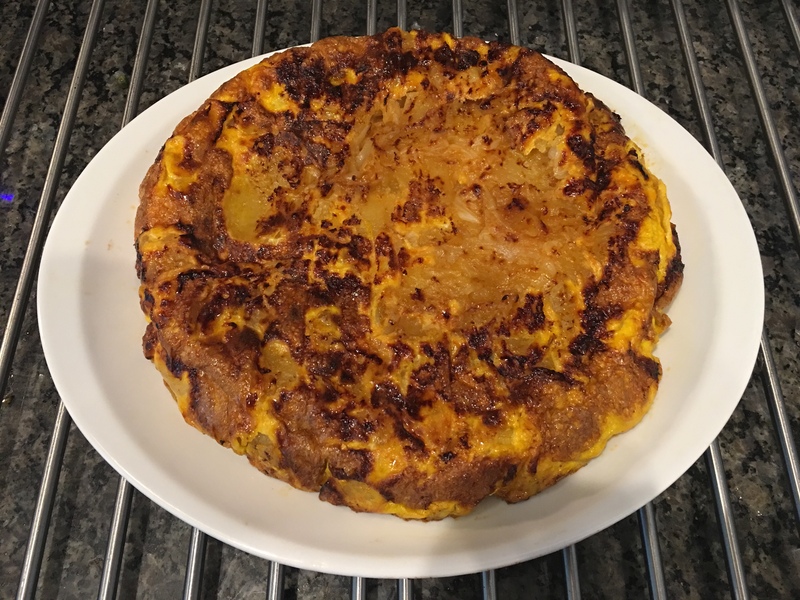 Use and/or duplication of this material in whole or in part is strictly prohibited, with the exception of one excerpt per article, which must be limited to 25 (twenty five) words, provided that full and clear credit is given to Marielena Montesino de Stuart. The excerpt must include the link to the original content. Marielena Montesino de Stuart, Marielena Speaks, Marielena Stuart, Valentine’s Day, One Man One Woman,Notizie, Noticias, News, Homosexual “marriage”, Current Events, ABORTION, L’Avortement, Matrimony, Marriage, Mariage, Matrimony, Marco Rubio, Ted Cruz, Jeb Bush. 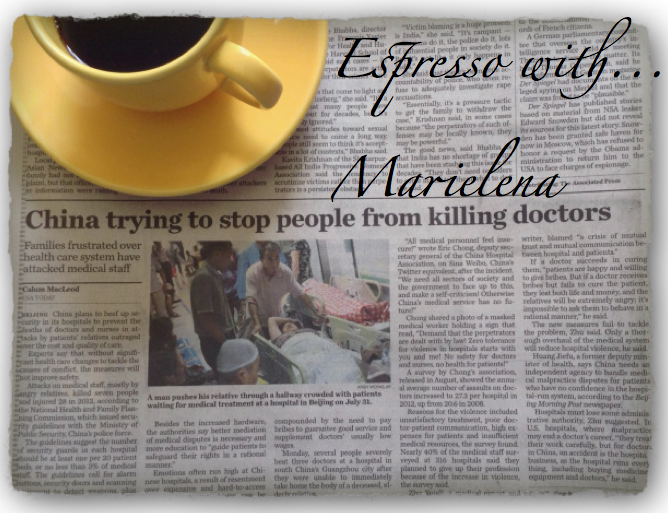 Iam drinking my afternoon espresso thinking about the Obamacare catastrophe– as I glance through different headlines. The failed launch of this monstrous government-run program should not be a surprise and its ‘interconnectedness’ (that’s globalization lingo) with Chinese “death” programs, is entirely palpable. Americans are facing the reality of socialism, as it aggressively manifests itself, and socialist operatives reap the “fruit” of their decades-long perseverance and dedication to the subjugation of the United States of America. The disastrous start of Obamacare is just a glimpse of what’s to come. Let’s take China as an example, where doctors and nurses are being killed by angry citizens who can no longer tolerate the incompetent and callous government-run “death” system in hospitals and medical facilities. China has been the long and cruel probe of socialized medicine– now being implemented on a global scale. The consummate communists at The Rockefeller Foundation have been busy designing “planetary health policies” by funding and collaborating with the Global Health Summit China, which was held on January 26-27, 2013 in Beijing. 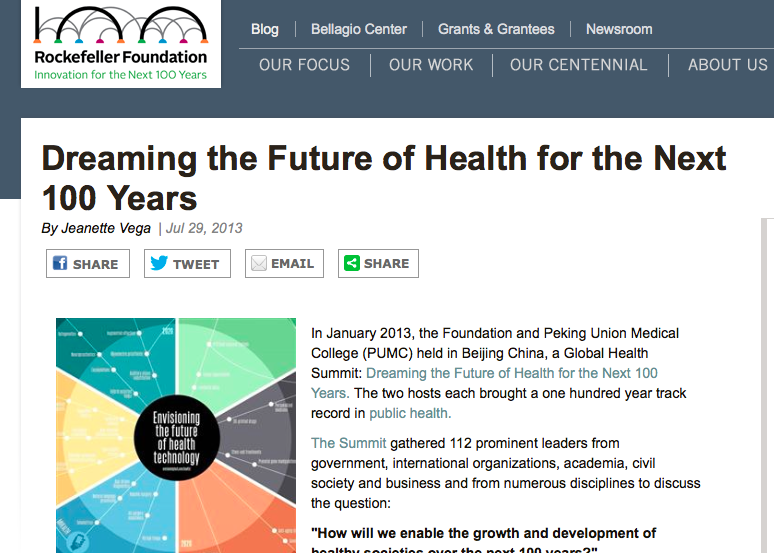 The theme of the summit was “Dreaming the Future of Health for the Next 100 Years.” Here is the white paper, detailing the plan for “planetary health policies”: THE ROCKEFELLER FOUNDATION – GLOBAL HEALTH SUMMIT CHINA, JANUARY 26-27, 2013 – Dreaming the Future of Health for the Next 100 Years. As the fanfare unfolded in Beijing– did The Rockefeller Foundation show any interest in addressing the killing of doctors and nurses by angry Chinese citizens? One can only assume that The Rockefeller Foundation sees the death of medical personnel as small collateral damage, for the greater global good. This cruel detachment from humanity’s rights under the natural laws of God, is the true centennial legacy of The Rockefeller Foundation. Join Marielena Montesino de Stuart’s special list of readers. Click HERE to join. This “window to the future” has a very dark past. The Rockefellers’ involvement in barbaric experiments involving human beings goes back to the 20th Century, when The Rockefeller Foundation helped fund and develop various eugenics programs– including the one where Josef Mengele received his training– in order to conduct his diabolical human experimentation in Auschwitz. The Population Council, founded by John D. Rockefeller III, has advanced depopulation programs inimical to the well-being of entire populations in Africa and many other parts of the world. The Population Council has had major involvement in the distribution of contraceptives– and has held the license for contraceptive devices, as part of its aggressive international “reproductive health” initiatives. Indeed, the centennial of The Rockefeller Foundation can take credit for the death of millions of human beings, through several generations– as a result of its abortion and abortifacient campaigns. The Rockefeller Foundation ranks as one of the most influential NGOs (non-governmental organizations) in the world– and joins others, like the Melinda and Bill Gates Foundation, in an international depopulation effort, under “smart globalization.” As my readers know by now, anything “smart” in modern parlance is related to Sustainable Development– the United Nations socialist initiative of global governance, also known as Agenda 21. Under Mao, it is estimated that 50-70 million Chinese citizens went to their deaths, through forced abortions, forced labor, executions and starvation– as a result of his infamous social experiment, known as the Great Leap Forward. 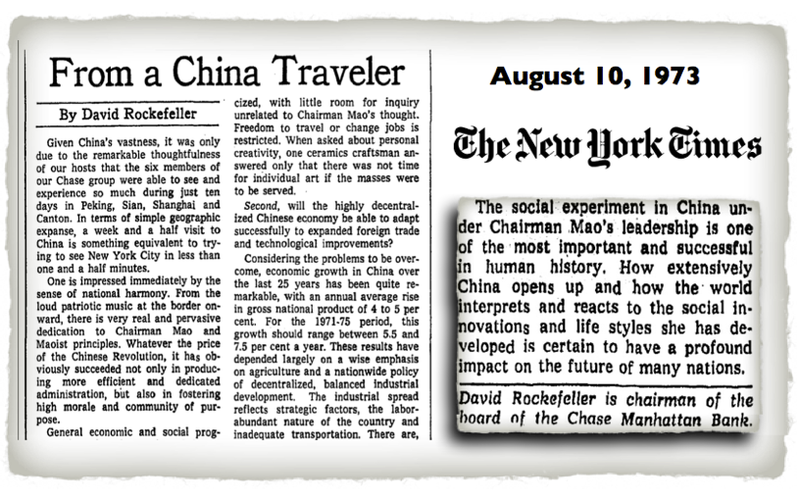 The “profound impact” resulting from “Chairman Mao’s leadership” has indeed been felt. It’s called Obamacare. So Americans will be joining Ana, Saito, Meng and Raúl—because the present looks very bad– and the year 2050 looks even worse in Washington DC, as the components of the Sustainable Development socialist machine, which makes up the bulk of our “globalized” public policies, continue to move into fifth gear. Only God can save the United States of America. Note: This article was originally published on October 31, 2013 by Marielena Montesino de Stuart for The Roman Catholic World.